The Public Policy Center (PPC) is one of the only interdisciplinary research centers in the central administration with the campus-wide mission of both conducting and stimulating research. For almost 30 years, the PPC has investigated and shared data and information about the most important issues affecting society. Our activities involve investigators from every college and our research is of local, state, national and international scope. In 2016-17, we maintained 18 active grants and contracts totaling nearly $15 million from Federal, State, and Foundation sources. The breadth of research topics this year included health care reform, healthy behavior incentives, racial disparities in criminal justice processing, integration of oral health and primary care, water demand, dental workforce, preventing violence in schools, governance of climate engineering, UI faculty and staff parental leave, social safety net policies, housing, public policy diffusion, income inequality, education policy and taxation, and local school climate. More than 132 journal articles, reports, presentations, proceedings, policy briefs, and blog posts have been published or delivered. We hosted 48 events, including five Forkenbrock Series symposiums/speakers, three fundraisers, Iowa Social Science Research Center workshops, the RELAX: TALK: GROW series, and co-sponsored an additional 48 events with campus and community partners. The center provided 89 undergraduate and graduate students, from a wide variety of disciplines, with applied research training experience and opportunities to collaborate with their peers and colleagues. We also supported Big Ideas: Equality, Opportunity, and Public Policy in America, an undergraduate course exploring policy issues from interdisciplinary perspectives. Through the Iowa Social Science Research Center, we assisted researchers from 13 units across five colleges with applying for 34 grants, requesting $8.9 million in funding. The ISRC also completed data collection for 15 different projects. In addition, we directly support interdisciplinary research on campus through the Iowa Social Science Research Center, which provides grant development support and data collection and management services. Our researchers collaborate with and are supported by many federal, state, and local agencies. Nationally, this includes the Department of Health and Human Services, the Environmental Protection Agency, NASA, the National Science Foundation, the National Institutes of Health, and the National Safety Council. Within Iowa, collaborations include the Iowa City Community School District, Johnson County, and the Iowa Departments of Public Health, Human Services, Education and Transportation. Of particular scientific significance, our health policy researchers have had two articles accepted in Health Affairs, the top health policy journal in the country. Our research monographs also receive significant national and international attention through our website and through Iowa Research Online. Iowa Research Online is managed by the UI Libraries and features more than 240 PPC papers that were downloaded more than 6,114 times in the past year. Click here to view 2016-2017 publications. The PPC's Environmental Policy Research Program investigates issues such as water use, pollution and climate change. These challenges are considered from an economic, legal, and/or policy perspective. David Cwiertny, associate professor of civil and environmental engineering, directs the program. When it came time for David Cwiertny to plan his sabbatical, a time away from classroom teaching duties that many professors use to make progress on a book or conduct research, the University of Iowa College of Engineering professor decided to take a different route. He decided to go into politics. Jonathan C. Carlson, professor of law and international studies and Victor and Carol Alvarez Fellow in Law in the UI College of Law, spent the Spring 2017 semester in Trento, Italy, as part of the Fulbright U.S. Scholar Program. Carlson taught a course called Conflict of Laws (Private International Law) while researching international environmental law at the University of Trento. David Cwiertny, associate professor in the Department of Civil and Environmental Engineering in the UI College of Engineering and associate faculty research engineer at IIHR--Hydroscience & Engineering, received the 2016 Super Reviewer Award from Environmental Science & Technology (ES&T). Every year, the associate editors of ES&T identify reviewers whose contributions stand out in terms of quality, timeliness, and quantity. Scott Spak's work was highlighted in Sensing Our Planet: NASA Earth Science Research Features 2016. The article takes a look at the connection between smoke plumes and severe tornadoes. Each year, Sensing Our Planet features intriguing research that highlights how scientists are using Earth science data to learn about our planet. Spak is an assistant professor in the School of Urban and Regional Planning in the UI Graduate College. Lucie Laurian, professor in the School of Urban and Regional Planning (URP) in the UI Graduate College, was awarded the annual Faculty Award from the Iowa Initiative for Sustainable Communities (IISC). This award honors her commitment to URP student capstone projects, which complete real-world planning projects with local communities. The PPC's Health Policy Research Program investigates the effects of policy initiatives and government activities on cost of, access to, and quality of health care systems and their effects on consumers, health care providers, policymakers, and businesses across Iowa and the nation. Peter Damiano, professor of preventive and community dentistry, directs the program. Elizabeth Momany, associate research scientist at the PPC, is the assistant director of the program. Is it the way the food is displayed? A creative meal description? The first thing you see when your stomach is growling? When it comes to school lunch, it can be all three and more. A partnership among the University of Iowa Public Policy Center, the College of Public Health, the Iowa Department of Education, and five high schools across the state aims to make healthy choices easier by empowering students to assess and change their lunchroom. Dr. Peter Damiano was invited to serve on the Legislative Advisory Committee (LAC) of the American Dental Education Association (ADEA). The LAC provides advice and counsel to the ADEA on public policy and legislative priorities. It promotes policies and programs that improve the nation’s oral health, advance dental and craniofacial research and education, reduce oral health disparities and increase access to dental care. Damiano will serve a three-year term. Dr. Susan McKernan, assistant professor, Dr. Ray Kuthy, professor, and Dr. Julie Reynolds, visiting assistant professor, all in the Department of Preventive and Community Dentistry, were awarded funding from the Centers for Disease Control and Prevention (CDC) to explore the integration of oral health and primary care. The team will conduct a one-year project to identify best practices for integrating medical and dental care in public health activities and to identify opportunities to include oral health in the ongoing climate of health care reform. Dr. Astha Singhal, assistant professor in the Department of Health Policy and Health Services Research in the Henry M. Goldman School of Dental Medicine of Boston University, received the Aubrey Sheiham Award for Distinguished Research in Dental Public Health Services. Singhal's award was for her article, “Eliminating Medicaid Adult Dental Coverage in California Led to Increased Dental Emergency Visits and Associated Costs,” which was published in the May 2015 issue of Health Affairs. Suzanne Bentler and Betsy Momany were invited to present at the Urban Institute’s “Research Evaluations of Medicaid Expansions under the ACA: Sharing Results and Comparing Approaches,” on Nov. 16, 2016 in Washington, D.C. Bentler, Assistant Research Scientist, and Momany, Assistant Director and Associate Research Scientist, presented selected results from the Iowa Health and Wellness Plan as part of a session on states’ experiences with Medicaid expansion waivers. They conducted their research along with PPC researchers Peter Damiano, Dan Shane, Natoshia Askelson and Brad Wright. The Politics and Policy Research Program conducts research on local, state, national, and international government and politics, and how these politics affect the creation of public policy. We also consider whether and to what extent governments “work” and the implications of government design. Tracy Osborn, associate professor of political science, directs the program. The Politics and Policy Research Program hosted a series of events leading up to the 2016 Presidential Election as part of the Forkenbrock Series on Public Policy. The events examined a variety of political topics, including environment, health, education, and women in politics, among others. Fred Boehmke, professor in the Department of Political Science in the UI College of Liberal Arts and Sciences, received a grant from the National Science Foundation (NSF). The $420,000 grant will fund two years of research at the University of Iowa and three other universities – Penn State, Notre Dame and the University of Massachusetts. Through the research supported by the grant, Boehmke will produce a database on the adoption of hundreds of policies of American states, at least tripling the size of the largest database currently available and yielding a more representative sample of policies. Boehmke also received a $202,820 three-year grant from the NSF to create the database. Rebecca Kreitzer, assistant professor of public policy at the University of North Carolina, Chapel Hill, collaborated with Tracy Osborn, associate professor in the Department of Political Science in the UI College of Liberal Arts and Sciences, as part of the PPC’s inaugural Summer Scholars Program. In early 2016, Kreitzer and Osborn were asked to join a large, cross-country comparative study called Gender Equality in Public Policy (GEPP). The study considers eight key policy areas relevant to women’s equality. Kreitzer and Osborn’s research focus is on political representation in the United States, specifically on informal policy mechanisms for recruiting women candidates. After the program, Kreitzer accepted a secondary appointment with the PPC. The Social and Education Policy Research Program conducts research on social policy, education policy and finance, criminal justice, and housing policy; participates in community-engaged research partnerships; and provides research internship opportunities for students at the University of Iowa. Sarah Bruch, assistant professor of sociology, directs the program. Mark Berg, associate professor in the Department of Sociology in the UI College of Liberal Arts and Sciences, began a collaboration with the Johnson County Board of Supervisors and the Johnson County Attorney to evaluate racial and ethnic disparities in case processing and sentencing. RELAX: TALK: GROW (RTG) received an African American Studies Community Service Award for the 2016-2017 series. The community service award recognizes organizations and programs that serve people and diverse communities, address important community issues, have a measurable impact on the community, demonstrate exemplary commitment to volunteerism, or contribute to organized cultural and community endeavors. RTG is a networking/policy planning event hosted by the UI African American Council and the PPC. It is coordinated by Michael Hill, associate professor in the Department of English in the UI College of Liberal Arts and Sciences. Sarah Bruch, assistant professor in the Department of Sociology in the UI College of Liberal Arts and Sciences, released a UI parental leave survey report and presented the results at a forum hosted by the PPC and the Council on the Status of Women, with support from Family Services. The goal of the survey was to obtain information about the experiences and perceptions of parental leave among faculty and staff at the University of Iowa. The report summarized the results from the survey, including respondent suggestions for improvements regarding the experience of taking parental leave at the University of Iowa as well as for improving the overall climate surrounding parental leave. Cassie Barnhardt, assistant professor in the UI College of Education, and Nick Bowman, associate professor in the UI College of Education, collaborated with Sarah Bruch as part of the PPC’s inaugural Summer Scholars Program. The trio worked toward developing a framework for educational inclusion. The project focused on identifying principles of organizational practice and policy that contributed to the ways in which members of educational communities experience their educational climates. After the program, Barnhardt and Bowman accepted secondary appointments with the PPC. The Transportation and Vehicle Safety Research program works to improve technology design through a better understanding of human behavior. The challenge is to match user needs with the optimal solutions—technological or otherwise. Daniel McGehee, associate professor of mechanical and industrial engineering, occupational health and emergency medicine, directs the program. To commemorate National Teen Driver Safety Week, the Transportation and Vehicle Safety Program released a study that found significant shifts occurring in distracted teen driving. Proportionally more than any other age group, teens involved in fatal crashes are reported to have been distracted at the time of the crash. Distractions vary widely, with the most prevalent behaviors including attending to passengers, cell phone use, and attending to something inside the vehicle. Inexperience, overconfidence, social pressures, a tendency to underestimate risk, and more frequent engagement in risky behavior are just a few of the factors confronting teen drivers today. Daniel McGehee was appointed director of the National Advanced Driving Simulator (NADS) at the University of Iowa’s Center for Computer-Aided Design (CCAD), effective Aug. 17, 2016. McGehee has studied car crashes for more than 20 years and is a leading expert. His driver performance, distraction, and technology development research has led to innovative, interdisciplinary collaborations involving engineering, medicine, and public health. Hosin (David) Lee, professor in the Department of Civil and Environmental Engineering in the UI College of Engineering, was named chairman of the 2017 International Conference on Maintenance and Rehabilitation of Constructed Infrastructure Facilities (2017 MAIREINFRA), held July 19-21, 2016, in South Korea. The conference is for workers and researchers involved in maintaining, rehabilitating, managing, preserving, and resiliating sustainable infrastructure systems worldwide. MyCarDoesWhat, a vehicle education safety initiative from the National Safety Council and the University of Iowa, received a Platinum PR Award for Public Service Announcement at the 2016 PR News Platinum Awards ceremony held in New York City. The Platinum PR Awards recognize the year's most outstanding communicators, initiatives, and organizations in the public relations arena. Corinne Peek-Asa, professor and associate dean for research in the Department of Occupational and Environmental Health in the UI College of Public Health, was recognized at the 2017 University of Iowa Celebrating Excellence: Discovery and Innovation Awards Ceremony. Peek-Asa received the Faculty Communicating Ideas Award. The award recognizes excellence in communication about research and scholarship in the sciences and humanities and the study of creative, visual, and performing arts to a general audience directly or via print and electronic media. The Iowa Social Science Research Center (ISRC) is a resource for interdisciplinary social science research. It provides grant development support and data collection, management, and access services to the university community and beyond. Fred Boehmke, professor in the Department of Political Science in the UI College of Liberal Arts and Sciences, is director of the ISRC. The ISRC hosted a number of events during 2016-17 focused on outreach and teaching, including two Data Science Institutes and a series of National Science Foundation (NSF) mini workshops. ISRC staff supported 34 grants and scholarships, working with Principal Investigators across 13 departments from five colleges. These applications went to 16 different sponsors and totalled nearly $8.9 million. In addition to continuation of projects initiated in AY 2016, the center initiated 15 new data collection projects currently in various stages of implementation. The ISRC provided cost estimates for an additional five data collection projects that are pending funding. The ISRC offered one-on-one consults for methodological questions on a variety of topics. A cadre of graduate students were on call for a few hours a week to provide consults and advice with data, statistical, and software questions. The services were free of charge to the user for the first hour or two. Jacinta Fillinger, who was hired as a Data Coordinator during the 2016-17 academic year, also offered drop-in hours for data consulting. In the past two years, the ISRC hosted 50 social science methods workshops with approximately 500 attendees, co-organized two week-long Data Science Institutes with more than 500 registrations, and conducted more than 70 consultations on data analysis techniques and survey methods for faculty, staff, and student researchers. During academic year 2016-17, the PPC employed 89 students who assisted with research, data collection, and administrative support. Fifty of the undergraduate students employed by the PPC were trained by the ISRC in social science research activities, including data collection methodology and human subjects training. 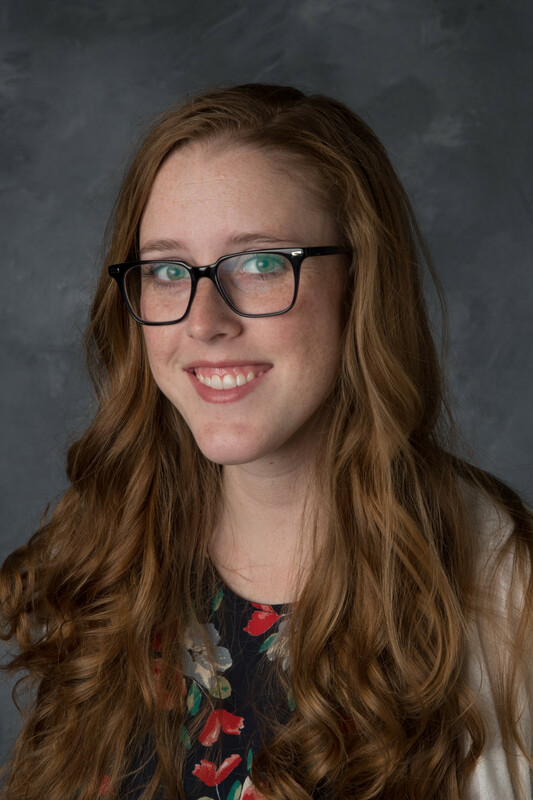 Jen Sukalski, graduate research assistant in the Health Policy Research Program, won the Keith E. Heller Dental Public Health Graduate Research Award from the Department of Preventive and Community Dentistry in the UI College of Dentistry and Dental Clinics. The award is given to a graduating student for excellence in research in the field of dental public health. Sukalski received a plaque and a one-year membership to the American Association of Public Health Dentistry. Many of our events aim to engage the student community in policy-relevant research happening across campus. 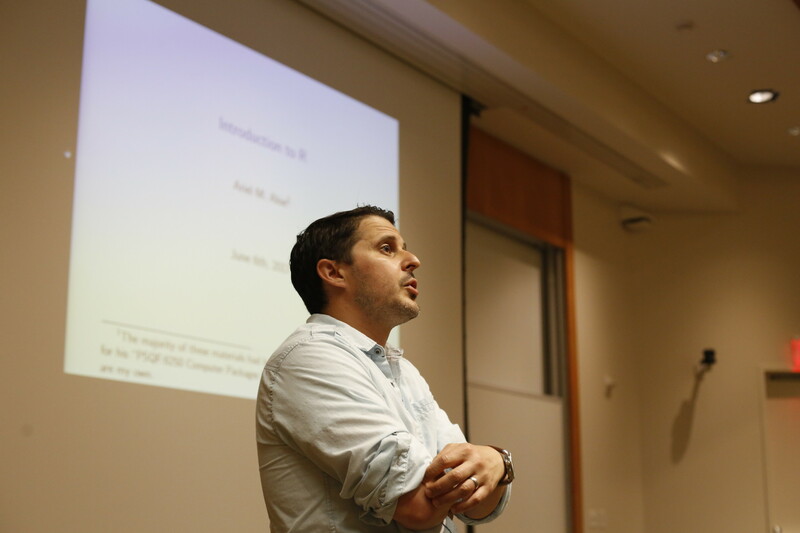 For example, the PPC hosted Jay Newton-Small, author and Washington correspondent for TIME magazine, for a lecture and book signing that featured a book giveaway for UI students. The center also supported the class Big Ideas: Equality, Opportunity, and Public Policy in America, an undergraduate course focused on the policy challenges posed by the search for economic security and equality of opportunity. Each topical unit concluded with a public forum, bringing together the campus and local community to discuss major social issues facing us today. 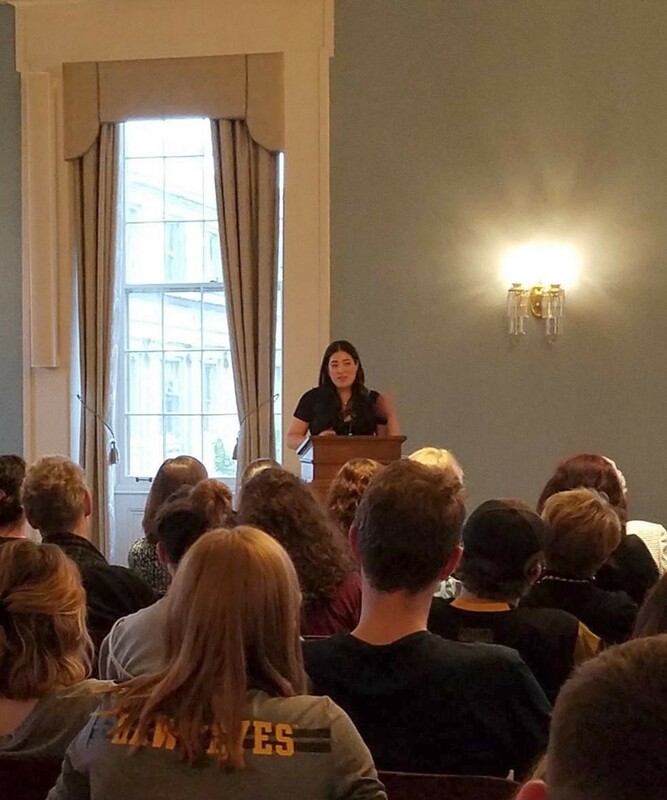 Six students worked as interns in Summer 2017 with Sarah Bruch, Director of the Public Policy’s Social and Education Policy Research Program and assistant professor in the Department of Sociology in the UI College of Liberal Arts and Sciences. Three students – Pearis Bellamy, Janee Harris, and Aubria Myers – were part of the UI Summer Research Opportunities Program (SROP). SROP is an award-winning program designed to provide promising underrepresented students with in-depth research experiences. Students receive first-hand exposure to the graduate school experience and to faculty life by being paired with a faculty mentor whose work is closely related to their academic interests and career goals. Three students – Austin Adams, Sean Finn, and Kaelynn Heiberg – were a part of the Social and Education Policy Research Program internship program. The research internship program is for undergraduate and graduate students at the UI. It provides students with training, experience, and mentoring in the context of faculty-driven research projects. Students are matched to a faculty project based on interest and availability. To fulfill our community engagement mission, the PPC hosted five Forkenbrock Series events, the RELAX: TALK: GROW series, and the Big Ideas: Equality, Opportunity, and Public Policy in America series. The Forkenbrock Series, which features guest speakers and symposia, provides a forum for dialogue about policy areas from applied, academic, and interdisciplinary perspectives. The series was established in honor of David Forkenbrock, who established the PPC at the University of Iowa in 1987. We also co-sponsored 48 events with other departments, including Jeffrey Toobin’s lecture, “Inside the Secret World of the Supreme Court,” and fundraising events for the UI Veterans Association, Neighborhood Centers of Johnson County, and Crisis Center of Johnson County. We collaborated with the Obermann Center for Advanced Studies and FilmScene to screen the documentary, “Starving the Beast: The Battle to Disrupt and Reform America’s Public Universities,” and the College of Public Health to screen the documentary "Newtown." 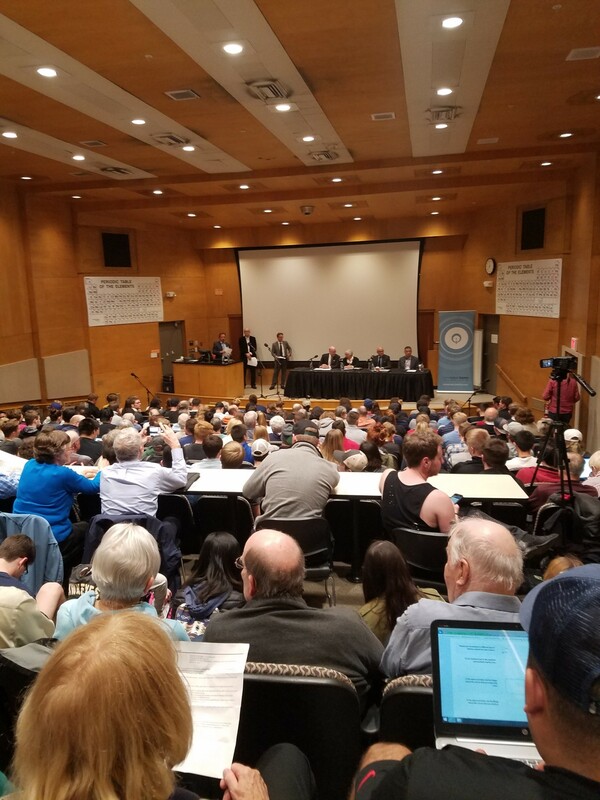 Shambaugh Auditorium was filled to capacity for “China, Iowa, and Diplomacy in the Trump Administration,” on May 3, 2017. A group of former ambassadors and China experts – all currently living in Iowa – discussed several topics, including U.S./China relations in the Trump administration, Iowa’s role in the United States’ relationship with China, Branstad as ambassador and the impact for Iowa and trade, and how Branstad’s selection fits within the broader vision of diplomacy in the Trump administration. Lynn Hicks, Opinion and Engagement Editor for The Des Moines Register, and Ben Kieffer, host of Iowa Public Radio’s River to River, moderated the discussion. The Effect of Women in Politics: Do They Make a Difference? On Nov. 1, 2016, the PPC hosted Jay Newton-Small for a lecture, “The Effect of Women in Politics: Do They Make a Difference?,” and book signing. The first 25 students to arrive at the event were given a free copy of her book, "Broad Influence: How Women are Changing the Way America Works." The lecture was a part of the Run Up to the 2016 Election series. Joining Newton-Small for a panel discussion after her remarks were Jean Lloyd-Jones, former Iowa State Senator, and Tracy Osborn, director of the Politics and Policy Research Program and associate professor of political science. Newton-Small was a Washington correspondent for TIME, and wrote about everything from Washington politics to foreign policy and national trends. She has written more than half a dozen TIME cover stories and contributed to dozens of others. She has interviewed numerous heads of state, including Presidents Barack Obama and George W. Bush, as well as senators, governors, and foreign dignitaries. On Oct. 11, 2016, Tim McBride presented “Health Insurance Coverage in a Post-election Landscape.” McBride is an influential health policy analyst and health economist shaping the national agenda on the uninsured and health insurance markets, rural health care, health reform, Medicare and Medicaid policy, long-term care, and health economics. Joe Palca, a science correspondent for National Public Radio (NPR) discussed creativity, innovation, and the translation of science on Nov. 16, 2016, as part of “Reporting on Remarkable Science and Remarkable Scientists.” Since joining NPR in 1992, he has covered a range of science topics — everything from biomedical research to astronomy. 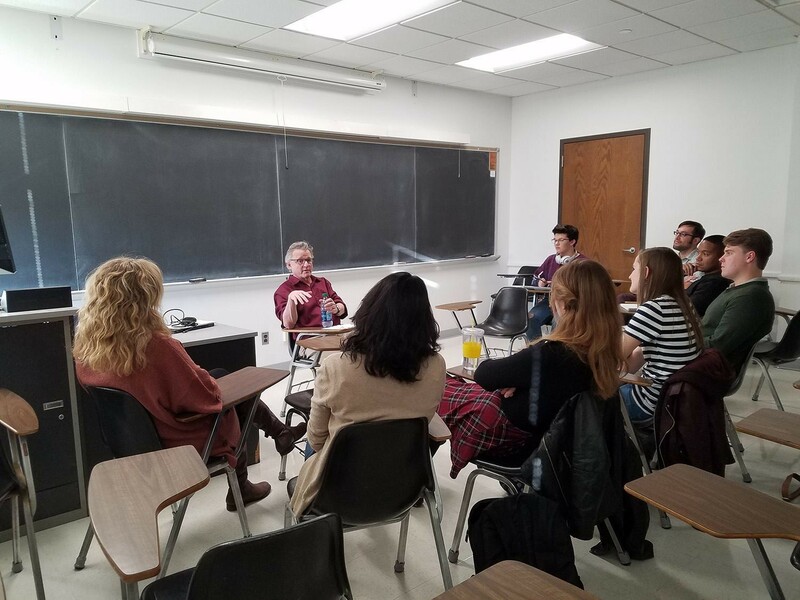 While Palca was on campus, he met with science and journalism students to offer guidance and answer their questions about science writing. On Feb. 15, 2016, David Daley, former editor-in-chief of Salon.com, and Jonathan Winburn, associate professor of political science at the University of Mississippi, participated in a moderated discussion, “Is Redistricting Polarizing America?” In most states, the legislatures are primarily responsible for both congressional and state legislative redistricting. In Iowa, an advisory commission draws both congressional and state legislative district lines, with the state legislature retaining final authority. Not as an elected official, however, but as a congressional staffer for a key environmental and energy committee—a government body that has seen its fair share of political feuds in recent months. Cwiertny was one of 35 science and technology experts who spent a year working in the U.S. Congress as part of a fellowship program sponsored by the American Association for the Advancement of Science (AAAS). As a staff member of the House Committee on Energy and Commerce, he worked on some of the most pressing environmental issues of our day, including cleanup of lead-tainted drinking water in Michigan, a controversial proposal to store nuclear waste in the Nevada desert, and the use of toxic chemicals in manufacturing and industry. Besides sharpening his policy skills, Cwiertny also witnessed the first 100 days of the Trump administration, as well as the effects of a Republican takeover of the House and Senate. It’s an experience, he said, that has taught him a lot about the role of government in crafting effective environmental and energy initiatives. Cwiertny returned to Iowa in August and reflected on how the experience could change his approach to academic research and classroom instruction. Q: What were some of the highlights of your work on Capitol Hill? A: There were so many highlights, too many to mention here, but I really enjoyed contributing to the legislative process. For example, I had the privilege of writing talking points and questions for hearings that were used by members of Congress. I also contributed to letters written by members of Congress that were sent to federal agency administrators and even to President Trump. There were also fun highlights associated with the special access fellows have at the Capitol. I was able to sit on the floor of the House of Representatives during a legislative debate and submit a bill. It may sound silly, but it was also pretty cool to be able to ride the subway and tram cars that take members of Congress to and from their office buildings to the Capitol. I still got a bit starstruck when I saw some of the more well-known members of Congress—Senators Elizabeth Warren and Tim Kaine, for example. Q: What was the biggest surprise for you as an outsider about the way work gets done in Washington? A: Before coming to Washington, I didn’t understand the considerable advantages that come with being a member of the majority party. For example, the majority gets a much bigger budget allocation for committee staff. So, in this Congress, Republicans had about twice as many staff working for them compared to Democrats. The majority party also sets the committee agenda, including which hearings to have and which bills to consider. At hearings, the minority party is allowed one witness for every three or four from the majority side. This allows the majority to shape and control the narrative around a particular issue; it’s a tremendous advantage that I don’t suspect most Americans appreciate. At least I didn’t. Q: What was the atmosphere like in Washington? From the outside, it seems like it might be acrimonious. A: That’s not a false perception. There aren’t too many issues on which the Republicans and Democrats agree, and even when both sides identify a problem, like funding for infrastructure, they usually have very different approaches to solving it. It was difficult for those who have worked on the Hill for some time to watch as the current administration reversed policies, effectively throwing out the many years of work it took to implement those policies in the first place. But that’s the reality of our governmental system. Q: Do you see this experience impacting the way you teach or conduct research? A: Absolutely. 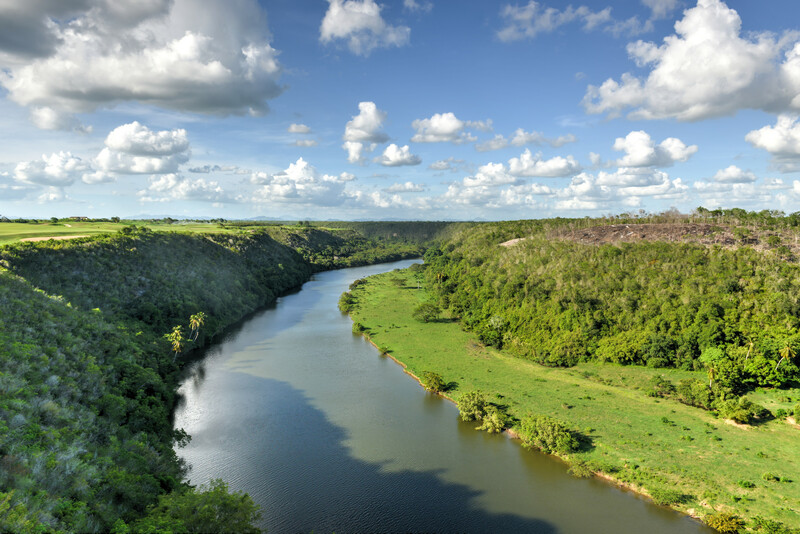 My colleagues and I at the university recently received a $3 million grant from the National Science Foundation to create a new graduate program in sustainable water development. One of the goals of this program is to support innovative training that will help graduate students find careers outside academia. In the fall, I’ll be co-teaching a new course titled Politics and Economics of Food, Energy and Water Systems, and my experience in Washington has been invaluable in developing this course and shaping its content. Many of the issues I worked on during the year—safe drinking water, alternative energy—are and will continue to be directly relevant to my teaching. Q: Do you hope to become more involved in policy work in the future? A: Yes. 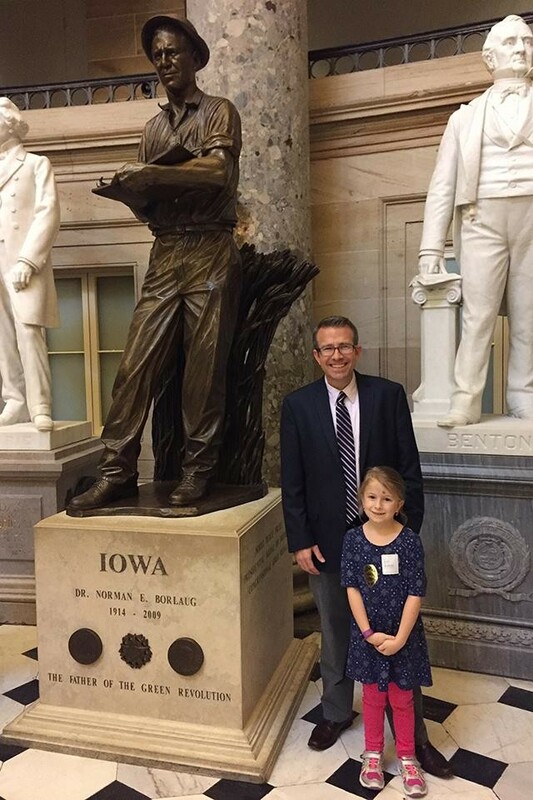 As director of the Environmental Policy Research Program at the UI Public Policy Center, I’ll continue to work at the interface of science and policy, focusing most on issues such as water quality and agriculture, issues that impact Iowa. I’ve done this kind of work before, but I hope to do more once I get back to campus. This story originally appeared in IowaNow. The Smarter Lunchrooms Movement applies simple and low cost changes to lunchrooms based on principles developed by the Cornell Center for Behavioral Economics in Child Nutrition Programs (BEN). The concept behind the BEN Center’s work is that simple environmental changes—like displaying whole fruit, making the entree with the greatest nutrition density most prominent in line, or giving vegetables creative names—have the power to “nudge” students to subconsciously make healthier eating choices while also improving school meal participation and decreasing waste. Natoshia Askelson, assistant professor at the College of Public Health and project lead, said the partnership aims to take the BEN Center’s research-based ideas—which have been used in schools across the country since the center’s launch in 2010—one step further by putting students and nutrition supervisors in charge. After meeting with each partner school individually to supply teachers, food-service directors, and students with background information on behavioral economics, Askelson and her research assistants prompted students, staff, and food-nutrition supervisors to complete a lunchroom self-assessment. 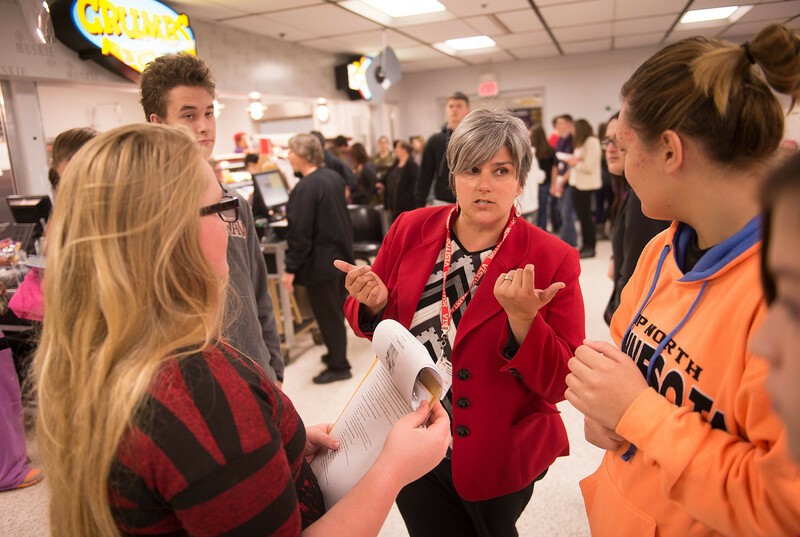 At Muscatine High School, 10th-grade students broke up into groups to tour their lunchroom. Weaving through crowds of their peers with clipboards and camera phones, they answered questions about how well their cafeteria focused on fruit, promoted vegetables and salads, and displayed healthy dairy items like white milk. The students were asked to photograph what they observed and share their findings with Askelson’s team. As part of the self-assessment, schools were asked to complete a scorecard based on the BEN Center’s principles to define their lunchroom strengths, areas for improvement, and possible intervention strategies. Now, they’re negotiating with their food-service directors to see which of their suggestions are feasible and helping implement changes in their cafeteria. So far, food-service directors say the project has been a great opportunity for self-reflection. Ultimately, Askelson said her team will evaluate the impact of the exercise by measuring sales, participation, and production data before and after changes are made. They also plan to conduct pre- and post-interviews to get a sense of how the project worked, in order to improve implementation if it is later rolled out on a larger scale. Participating high schools implemented changes to their lunchrooms and are now preparing to evaluate those changes. Then, Askelson and her team will visit the schools to help students and staff complete a second self-assessment to document progress. The research team is also planning to work directly with food-service specialists at each school to examine how those who serve students their food might have a role to play in encouraging healthy eating and expanding upon improvements. Askelson’s research assistants on this project include UI College of Public Health doctoral student Patrick Brady, undergraduate research assistant Samantha Budzyn, and social work doctoral student Cris Meier. “Power 2016: an American election,” by Jon Winet, member of the Social and Education Policy Research Program and professor in the UI School of Art and Art History. The blog is available at https://medium.com/uippc. The disproportionate representation of racial and ethnic groups in the criminal justice system is a persistent national concern. National estimates suggest racial and ethnic disparities particularly among black and Hispanic residents may exist at multiple stages of the criminal justice system, including the various dimensions of police contact, case processing, and sentencing. Researchers have speculated about the mechanisms behind these disparities, some of which include economic disadvantage, criminal behavior, organizational practices, cultural misunderstandings, legal guidelines, and racial bias. In response to this national concern, the Johnson County Board of Supervisors and the Johnson County Attorney are working with Berg to evaluate disparities in the county. The overall purpose of the proposed evaluation is to provide an empirical estimate of the degree of racial disparities across multiple stages of Johnson County’s case processing and sentencing, including case filings, pretrial detentions, case dismissals, plea offers, and incarceration. To do so, researchers are currently working closely with the County Attorney’s office to compile 2015 and 2016 case data currently filed by the County Attorney’s office. 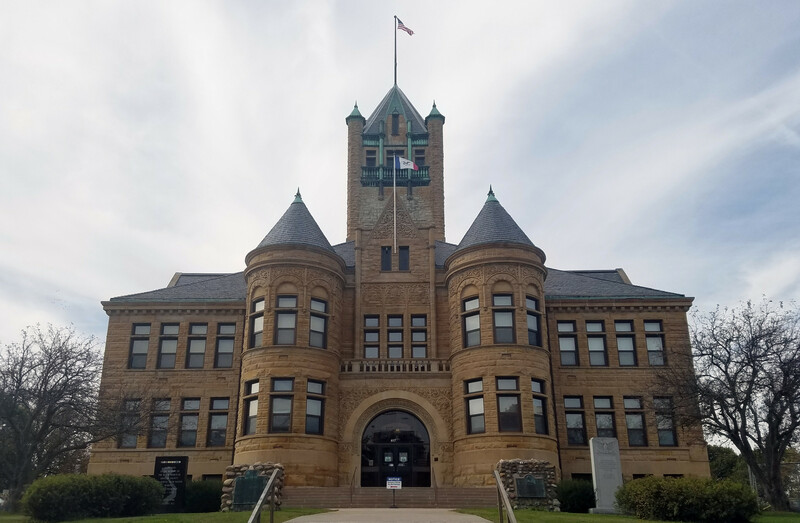 Once data collection is complete, researchers will examine felony, aggravated misdemeanor, and serious misdemeanor cases, and present an initial assessment of disparities in Johnson County’s case processing and sentencing to the Johnson County Board of Supervisors. October 16-22, 2016 was National Teen Driver Safety Week. During that week, the Transportation and Vehicle Safety Research program released a study that found significant shifts occurring in distracted teen driving. Determining what activities teens are engaging in before a crash occurs is not a simple task. Previous research has largely relied on survey and crash data. 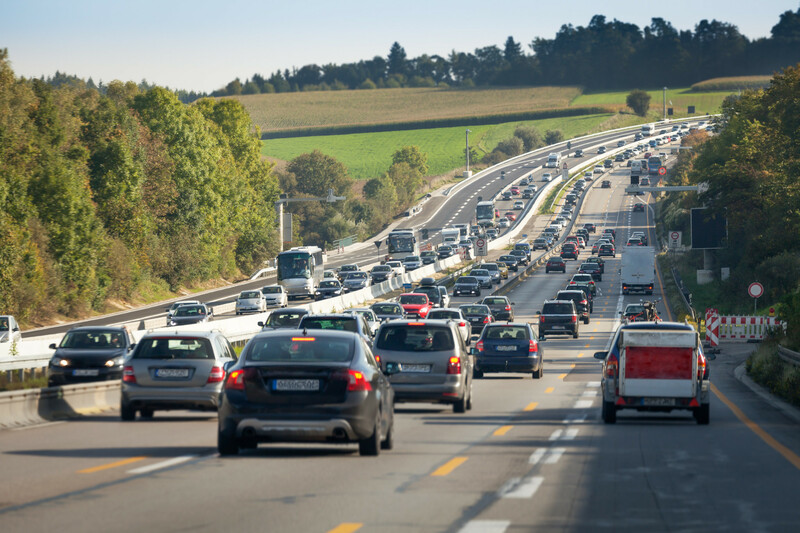 However, while helpful, this information has many limitations, as surveys relying on self-reporting and police reports are limited to officer, driver, passenger, or witness accounts. Naturalistic data, on the other hand, provides researchers with an unbiased view inside the vehicle during the critical seconds leading up to a crash. In the study, researchers with the University of Iowa used in-vehicle video recorders to supply naturalistic data, providing them with invaluable information regarding the behavioral and environmental factors present in a crash. With the analysis of these videos, researchers sought to identify the types of crashes teens are most frequently involved in, as well as the distractions or competing activities. The results show changes in the ways cell phones are used, from talking to texting, with trends suggesting further research be conducted. The Data Science Institutes featured a number of mini-classes and took place in January and June 2017. The workshops were a collaborative effort between the Iowa Social Science Research Center (ISRC) and the Iowa Informatics Initiative (UI3). The institutes taught participants about the basic building blocks of coding as applied in the fields of the biological, physical, social sciences, and digital humanities. The mini classes were open to faculty, staff, post-docs, graduate, and undergraduate students interested in building new skills in informatics. The topics included introductions to the Python and R programming languages, geospatial analysis and geovisualization, computational text analysis, social media analytics, and network analysis. Faculty from UI3, computer science, management science, and social science taught the courses in the new Informatics space in the College of Public Health Building on campus. The ISRC also hosted a series of National Science Foundation (NSF) mini workshops focusing on pre-award proposal development, the peer review process, and post-award grant issues. George Malanson, Coleman-Miller Professor in the Department of Geographical and Sustainability Sciences in the UI College of Liberal Arts and Sciences, conducted the workshops on NSF procedures and practices aimed at improving success rates of submitted proposals. Having recently completed an NSF rotator position in the Division of Environmental Biology, Malanson shared insights regarding NSF procedures and practices from a program officer perspective. The workshop series was designed to engage both researchers and research administrators while providing an in-depth understanding of what program officers and proposal reviewers are evaluating when reviewing proposals. Malanson has been at the UI since 1985. Last summer he returned from a two-year rotation at the NSF, where he was a program officer in the Division of Environmental Biology and also worked in the Dynamics of Couples Natural and Human Systems inter-directorate program (total of 17 panels). In the past he has served on NSF panels and a four-year term on an National Institutes of Health section. He has participated in 11 NSF-awarded projects, five as lead Principal Investigator. Sukalski has been a graduate research assistant at the PPC since 2015 and works directly with Dr. Julie Reynolds on Dental Wellness Plan (DWP) research. The DWP provides dental coverage for low-income adults previously ineligible for Medicaid. Sukalski is a licensed dental hygienist in Iowa and also has a bachelor’s of science degree in psychology. Before returning to the university to pursue her master’s degree, she worked in private practice as a hygienist for three years. She also taught 1st and 2nd year dental students as a clinical adjunct instructor in the UI College of Dentistry and Dental Clinics, which is something she has continued throughout her academic pursuits. “I saw a lot of DWP patients in private practice, so I was interested in the DWP and the needs of those patients. That piqued my interest in the research and my master’s degree,” Sukalski said. In Spring 2017, Sukalski presented a poster, “Iowa Dental Wellness Plan members’ self-reported effect of earned benefits on routine dental use,” at the National Oral Health Conference in Albequerque, New Mexico. The aim of the study was to examine the reported impact of the earned benefits model on members’ preventive care-seeking behavior. In the summer of 2017, Sukalski continued her work with DWP data and also worked with Reynolds on a best practices report on access to dental care with the development of workforce for the Association of State and Dental Directors (ASTDD). Sukalski graduated with her master’s degree in dental public health in Spring 2017. Her thesis, “Periodontal treatment needs of a Medicaid expansion population,” was a chart review of patients who had come in as new patients between 2014 and 2016 – the first two years of the DWP – based on research that Sukalski did with her thesis adviser, Dr. Susan McKernan. Sukalski began coursework for her Ph.D. in oral sciences with an emphasis on dental public health in Fall 2017. Bruch SK, Haynes H, Hylka A. 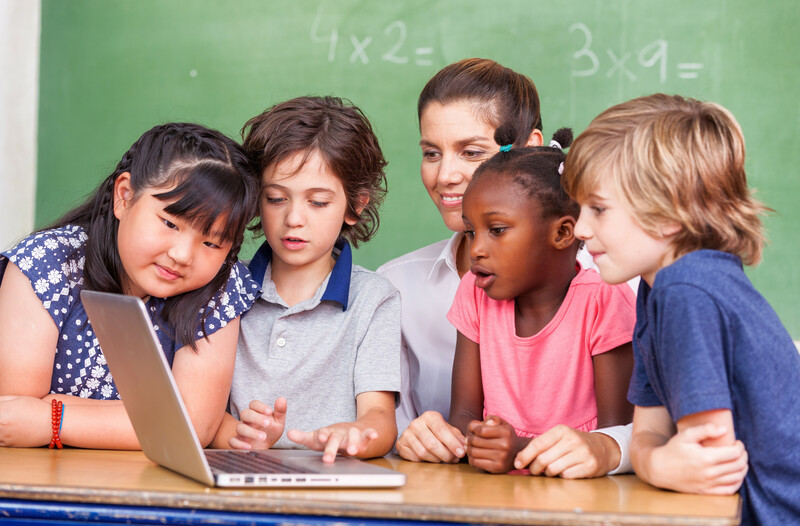 Focus Area Policy Brief: Teacher & Mentor Relationships. Iowa City, IA: University of Iowa Public Policy Center; 2016 . Bruch SK, Haynes H, Hylka A. Focus Area Policy Brief: Inclusive School Environment. Iowa City, IA: University of Iowa Public Policy Center; 2016 . Bruch SK, Haynes H, Hylka A. Focus Area Policy Brief: Disciplinary Environment. Iowa City, IA: University of Iowa Public Policy Center; 2016 . Wammer KH, Anderson KC, Erickson PR, Kliegman S, Moffatt ME, Berg SM, et al.. Environmental Photochemistry of Altrenogest: Photoisomerization to a Bioactive Product with Increased Environmental Persistence via Reversible Photohydration. 2016;50(14):7480 - 7488. Baltrusaitis J, Patterson EV, Connor M’, Qu S, Kolodziej EP, Cwiertny DM. Reversible Photohydration of Trenbolone Acetate Metabolites: Mechanistic Understanding of Product-to-Parent Reversion through Complementary Experimental and Theoretical Approaches. 2016;50(13):6753 - 6761. Bilal M, Nichol JE, Spak SN. A New Approach for Estimation of Fine Particulate Concentrations Using Satellite Aerosol Optical Depth and Binning of Meteorological Variables. 2016;. Laurian L, Crawford J. Organizational Factors of Environmental Sustainability Implementation: An Empirical Analysis of US Cities and Counties. 2016;18(4):482 - 506. Bruch SK, Meyers MK, Gornick JC. Separate and Unequal: The Dimensions and Consequences of Safety Net Decentralization in the U.S. 1994-2014. 2016 . Carney C, McGehee DV, Harland K, Weiss M, Raby M. Policy brief: UI study finds significant shifts occurring in distracted teen driving. 2016 . Bentler SE, Heeren T, McInroy B, Momany ET, Damiano PC. Experiences of Adults and Children in the Iowa Medicaid Integrated Health Home Program. Iowa City, IA: University of Iowa Public Policy Center; 2016 . Bentler SE, Damiano PC, McInroy B, Momany ET. Experiences of Iowa Medicaid Health Home Enrollees (Program Period 2013-2015). Iowa City, IA: University of Iowa Public Policy Center; 2016 . Askelson NM, Edmonds SW, Momany ET, Tegegne MA. Understanding Clinic Practices for Human Papilloma Virus Vaccination Series Completion in Clinics That Provide Primary Care. 2016;43(7):445 - 449. Dion D, Boehmke FJ, MacMillan W, Shipan CR. The Filibuster as a War of Attrition. 2016;59(3):569 - 595. Ayyagari P, Frisvold DE. The Impact of Social Security Income on Cognitive Function at Older Ages. 2016;244418283(441):463 - 488. Anderson CC, Mitchell SMcLaughlin, Schilling EU. Kantian Dynamics Revisited: Time-Varying Analyses of Dyadic IGO-Conflict Relationships. 2016;42495215513(4114):644 - 676. Spak S. Constraining urban-to-global scale estimates of black carbon distributions, sources, regional climate impacts, and co-benefit metrics with advanced coupled dynamic - chemical transport - adjoint models. 2016. Bills DB. Living, Learning, and the New Higher Education. 2016;458643(63):690 - 695. Spak S. PCBs in Chicago: Sources, Transport, Fate, Exposure, and Policies. 2016. Spak S. Identifying a Safe Operating Space for Humanity at the urban scale using high-throughput environmental modeling. 2016. Frisvold DE. Food Assistance Programs and Child Development. 2016. Oneyear N, Hallmark S, Carney C, McGehee DV. Prediction of lane encroachment on rural two lane curves using the SHRP 2 naturalistic driving study data. 2016 . Bills DB. Congested credentials: The material and positional economies of schooling. 2016;43:65 - 70. Spak SN. This is the Anthropocene, and we're not just input files anymore: coupling urban Human and Earth Systems models for decision support. 2016. Bills DB. Education and Development. In University of California Press; 2016. Spak SN, Ward AS, Li Y, Dalrymple KE. Influences of historical and projected changes in climate and land management practices on nutrient fluxes in the Mississippi River Basin, 1948-2100. 2016. Boehmke FJ. The Diffusion of Model Legislation. 2016. Just CL, Johannes A, Osterberg DO, Spak SN. Using Hollywood to make protective policy on chemicals. 2016. R. Priest T. Book Review: Panic at the Pump. 2016;. R. Priest T. Shifting Sands: The 1973 Oil Shock and the Expansion of Non-OPEC Supply. In I.B. Tauris; 2016. Liu X, Peate I, Spak SN, Mattes TE. Reconstructing ancient prokaryotic lake communities from Lake Leija paleosediments in the Atacama desert. 2016. R. Priest T. Book Review: The Green and the Black. 2016;. R. Priest T. Petrobras and the History of Innovation in Offshore Oil. In Oxford University Press; 2016. Heiden E, Park K, Buskirk TD, Bareham JS, Losch M. Getting to the root of a STEM statewide survey: Using historical paradata to adapt sampling frames over time. 2016. R. Priest T. Frackenstein’s Monster: A History of Unconventional Oil and Gas Technology. In Ice Cube Press; 2016. R. Priest T. The Marvel of Electricity. 2016;. Herkert NJ, Spak SN, Smith A, Martinez A, Schuster J, Harner T, et al.. Simulated sampling rates across the Global Atmospheric Passive Sampling (GAPS) Network. 2016. R. Priest T. Ignoring the Shale Revolution. 2016;. Priest T. Shrimp and Petroleum: The Social Ecology of Louisiana’s Offshore Industries. 2016;21(3):488 - 515. Neal TA, Kylbarda K, Spak SN. Climate science and Iowa’s science standards. 2016. Ramirez M, Eyck PTen, Peek-Asa C, Onwuachi-Willig A, Cavanaugh JE. Evaluation of Iowa’s anti-bullying law. 2016;3267025531694132285231044245155(15434106 Suppl 131616145). Ramirez M, Bedford R, Wu H, Harland K, Cavanaugh JE, Peek-Asa C. Lighting and marking policies are associated with reduced farm equipment-related crash rates: a policy analysis of nine Midwestern US states. 2016;73991499409922383112119470231179111115316934140415(9):621 - 626. C P-A. How Can Research Inform Firearm Policy. 2016. Bruch SK. Building Bridges Through a Research-Practice Partnership. 2016. Tinkle M, Daack-Hirsch S. Examining the Evidence for Clinical Decision Support Tools for Genetic Testing. 2016. Anthony J. Estimating the relative impact of Source of Income discrimination in Housing Choice Voucher tenants search for housing. 2016. Bruch SK. Key Focus Area Policy Briefs on Teacher and Mentor Relationship, Inclusive School Communities, and Equitable Disciplinary Climates. 2016. Atchison CG. State Hygienic Laboratory Legislative Focus. 2016. Anthony J. From Centralized Planning to Grass-roots planning: A case-study in Kerala, India. 2016. Ingleshwar A, McKernan SC, Kuthy RA, Reynolds JC, Damiano PC. Dentists' attitudes towards the earned benefits structure of Iowa Medicaid's Dental Wellness Plan. 2016. Rohweder C, Friedman DB, Askelson NM, Flocke S, Glanz K, Ko L, et al.. What Are the Best Intervention and Implementation Strategies for CRC Screening at FQHCs: A Review of Reviews. 2016. Bentler SE, Momany ET. Iowa Health and Wellness Plan Selected Results. 2016. McDonald AB, Reyes ML, Roe CA, Friberg JE, Faust KS, McGehee DV. Technology Demonstration Study. Iowa City, Iowa: The University of Iowa and National Safety Council; 2016 . Askelson NM, Delger PJ, Scheidel CA. Satisfy students’ taste preferences through Smarter Lunchroom changes. 2016. McGehee DV, Schwarz C, Smith BW, Brewer M. Review of Automated Vehicle Technology: Policy and Implementation Implications. Ames, Iowa: Iowa Department of Transportation ; 2016 . Askelson NM, Golembiewski E, Meier C, Smith R, Wilson S, Lillejo CI, et al.. Please! Please get me the carrots!”: A qualitative examination of parent-child communication about fruits and vegetables from the child's perspective. 2016. McGehee DV. Engineering consumer understanding of higher levels of automation. 2016. Golembiewski E, Askelson NM, Bentler SE, Momany ET, Smith R. Administrative perspectives on barriers to integrating primary care and mental health services in community-based settings: A qualitative evaluation of Iowa's Integrated Health Home demonstration program. 2016. McGehee DV. The past, present and future of automated driving. 2016. Sabbagh N, Brady P, Askelson NM, Wright B. “I don't actually know, I don't know anything about how it works”: A qualitative examination of members' low awareness of a state health insurance program. 2016. Hill M. Timely Exile: James Alan McPherson, The Iowa Writer's Workshop, and Black Creativity. In Iowa City, Iowa: University of Iowa Press; 2016. pp. 123-136. Bruch SK, Heeren T, Burns R, Rodriguez I. Iowa City Community School District Multi-Stakeholder School Climate Task Force. Iowa City, IA: University of Iowa Public Policy Center; 2017 . Heeren T, Dulf D, Bozdog E, Chereches RM, Syed A, Aro AR. Integrating Evidence Into Health Policy: Navigating Cross-sectoral and Interdisciplinary Collaboration. 2017. Seiple E, Zitzner A, Anthony J, Dusil R, Lehman K, Martin G. Racial Segregation in Iowa's Metro Areas, 1990 - 2010. Iowa City, IA: University of Iowa Public Policy Center; 2017 . Bruch SK, Munasinghe H, Lyu Y. University of Iowa Parental Leave Survey Report. Iowa City, IA: University of Iowa Public Policy Center; 2017 . McKernan SC, Momany ET, Ingleshwar A, Ayyagari P, Singhal A, Shane DM, et al.. Access, Utilization, and Cost Outcomes: Iowa Dental Wellness Plan Evaluation 2014-2016. Iowa City, IA: University of Iowa Public Policy Center; 2017 . Bruch SK, Heeren T, Shi Q, Maller R, McCaffrey M, Nucaro N, et al.. Student Experiences of School Climate in the Iowa City Community School District 2017. Iowa City, IA: University of Iowa Public Policy Center; 2017 . Bentler SE, Heeren T, McInroy B, Momany ET, Damiano PC. Experiences of Adults and Children in the Iowa Medicaid Integrated Health Home Program. Iowa City, IA: University of Iowa Public Policy Center; 2017 . Singhal A, Damiano P, Sabik L. Medicaid Adult Dental Benefits Increase Use Of Dental Care, But Impact Of Expansion On Dental Services Use Was Mixed. 2017;36(4):723 - 732. 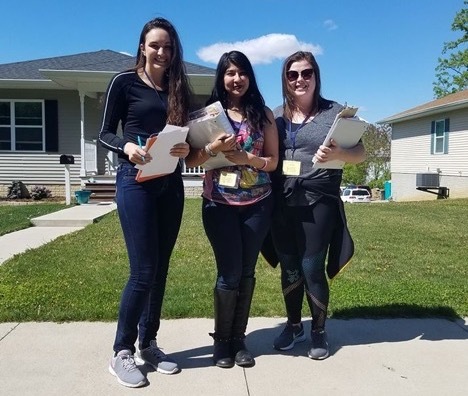 Askelson NM, Wright B, Bentler S, Momany ET, Damiano P. Iowa’s Medicaid Expansion Promoted Healthy Behaviors But Was Challenging To Implement And Attracted Few Participants. 2017;36(5):799 - 807. Askelson NM, Golembiewski EH, Baquero B, Momany ET, Friberg J, Montgomery D. The importance of matching the evaluation population to the intervention population: Using Medicaid data to reach hard-to-reach intervention populations. 2017;60:64 - 71. Hensel PR, Mitchell SMcLaughlin. From territorial claims to identity claims: The Issue Correlates of War (ICOW) Project. 2017;34(2):126 - 140. Claypool VHesli, Janssen BDavid, Kim D, Mitchell SMcLaughlin. Determinants of Salary Dispersion among Political Science Faculty: The Differential Effects of Where You Work (Institutional Characteristics) and What You Do (Negotiate and Publish). 2017;50321428281154653144546443936(01):146 - 156. Cawley J, Frisvold DE. The Pass-Through of Taxes on Sugar-Sweetened Beverages to Retail Prices: The Case of Berkeley, California. 2017;(2):303 - 326. Mitchell SMcLaughlin. Dangerous bargains with the devil? Incorporating new approaches in peace science for the study of war. 2017;3442443345643542339524272518302152601391938(142164161133431441621):98 - 116. Pacheco J, Maltby E. The Role of Public Opinion—Does It Influence the Diffusion of ACA Decisions?. 2017;42(2):309 - 340. Boehmke FJ, Rury AMatthews, Desmarais BA, Harden JJ. The Seeds of Policy Change: Leveraging Diffusion to Disseminate Policy Innovations. 2017;42(2):285 - 307. R. Priest T. The Deepwater Golden Triangle: The Gulf of Mexico, Brazil, and West Africa in the Global Oil Economy. 2017. Bril JS, Langenfeld K, Just CL, Spak SN, Newton TJ. Simulated mussel mortality thresholds as a function of mussel biomass and nutrient loading. 2017;522143673011112584332743148543875850427352621617541158237351175272730(112314122373–441–23696931071122111210):e2838. Schlossberg M, Larco N, Slotterback CS, Connerly C, Greco M. Educational Partnerships for Innovation in Communities (EPIC): Harnessing University Resources to Create Change. Frank AI, Silver C. Cham: Springer International Publishing; 2017. pp. 251 - 268. Frisvold DE. Federal Statistical Research Centers: Opportunities for Researchers to Use Restricted Access Data workshop. 2017. Boehmke FJ, Brockway M, Desmarais BA, Harden JJ, LaCombe S, Linder F, et al.. A New Database for Inferring Public Policy Innovativeness and Diffusion Networks. 2017. Connerly C. How Are You Going to Keep Them on the Farm After They’ve Seen Iowa City? : Making Public Research Universities Relevant to the Rural Midwest. In University of Iowa Press; 2017. Ward AS, Spak SN, Balson T, Li Y, Dalrymple KE. Nutrient export from intensively managed landscapes integrates human and natural forcing. 2017. Boehmke FJ. The Diffusion of Model Legislation. 2017. Pacheco J, Maltby E. Trends in State Level Opinions toward the Affordable Care Act. 2017. Bills DB, Di Stasio V, rxhani Kë. The Demand Side of Hiring: Employers in the Labor Market. 2017;43(1):291 - 310. Aizpura E, Avery M, Wittrock J, Park K, Muilenberg R, Losch ME. Impact of advance letters on response rates and data quality in a statewide dula-frame survey. 2017. Avery M, Kong C, Park K, Losch ME. Iowa tobacco cessation program evaluation: FY 2016. Cedar Falls, IA: Center for Social and Behavioral Research, University of Northern Iowa; 2017 . R. Priest T. Wanted: Swing Producer. 2017;. Wittrock J, Aizpurua E, Losch ME, Heiden EO. The impact of multitasking on survey data quality: observations from a statewide telephone survey. 2017. Park K, Stephenson A, Strong S. Process evaluation of helpline in Iowa. 2017. Khandelwal M, Hill ME, Greenough P, Anthony J, Quill M, Linderman M, et al.. Why Have Improved Cook-Stove Initiatives in India Failed?. 2017;92:13 - 27. Anthony J. Housing price effects of growth regulations: a concise taxonomy. 2017;10285236966130586675(41311113):1 - 22. Bruch SK. Leveraging Teacher Knowledge and Experience to Improve the Iowa City Community School District Community-Research Partnership Project. 2017. McKernan S, Pooley M, Ingleshwar A, Momany E, Damiano P. Evaluation of Provider Network in the Iowa Dental Wellness Plan, 2014-2016. Iowa City, IA: University of Iowa Public Policy Center; 2017 . Atchison CG, Kurimski LJ. Applying Business Development Tools to Public Health Laboratory Strategy. 2017. Bruch SK. Iowa City Community School District Community-Research Partnership Project. 2017. Reynolds JC, McKernan SC, Damiano PC, Sukalski J, McInroy B. Evaluation of the Dental Wellness Plan: Member Experiences After Two Years. Iowa City, IA: University of Iowa Public Policy Center; 2017 . Atchison CG, Kurimski LJ, Marshall S. Using a Decision-Matrix to Guide Decision-Making & Resource Allocation. 2017. Bruch SK. Equity Implemented: A Community-Research Partnership Model. 2017. Reyes ML, Roe CA, McDonald AB, Friberg JE, McGehee DV. Adaptive Cruise Control: First Impressions Matter. In 400 Commonwealth Drive, Warrendale, PA, United States: SAE International; 2017. Anthony J. Is it Working? Determining the Effectiveness of Economic Development/Redevelopment/Improvement Projects. 2017. Bruch SK. Multi-Stakeholder School Climate Task Force Report Findings. 2017. Peek-Asa C, Reyes ML, Hamann C. In-Vehicle Video Feedback Systems and Parent Engagement: A Randomized Intervention to Improve Safe Teen Driving. 2017. C P-A. Policy and Advocacy Approaches to Reduce Injury. 2017. Anthony J. Faculty Social Entrepreneurship at a Research University. 2017. Bruch SK. Iowa City Community School District Research-Practice Partnership. 2017. Bruch SK, Heeren T. Building Equity Partnerships: Iowa City Community School District Community-Research Partnership Project. 2017. Atchison CG. Overview of the State Hygienic Laboratory. 2017. Bruch SK, Heeren T, Heiberg K, James A, Adams D, Shi Q. West Wind Implicit Bias Program in Iowa City Community Schools 2016-17 Program Evaluation Report. Iowa City, Iowa: University of Iowa Public Policy Center; 2017 . Chi DL, Park S, Momany ET, Jones MP, Kuthy RA, Askelson NM, et al.. Longitudinal Trends in Medical Well-Baby Visits and First Dental Visits. 2017. Roe C, McGehee DV. An Investigational Analysis of Driver Seat Belt Use, Timing, and Position in Naturalistic Driving. Ann Arbor, Michigan: Toyota Collaborative Safety Research Center; 2017 . Reynolds JC, McKernan SC, Kuthy RA, Damiano PC. Dentists’ ambivalence about earned benefits structure within Iowa’s Dental Wellness Plan. 2017. McKernan SC. Charting our course: the role of dental public health in health systems integration. 2017. Bruch SK, Heeren T, Maller R, Shi Q. Conflict 180 Restorative Justice Program in Iowa City Community Schools 2016-17 Program Evaluation Report. Iowa City, Iowa: University of Iowa Public Policy Center; 2017 . Kuthy RA, McKernan SC, Pooley M, Nguyen MN. Differences between communities with one or no general dentist. 2017. Kuthy RA, McKernan SC, Pooley M, Zimmerman MB. Relationship between community size and number of general dentists. 2017. Sukalski J, Reynolds JC, McKernan SC, Damiano PC. Iowa Dental Wellness Plan members’ self-reported effect of earned benefits on routine dental use. 2017. Levy SM, Warren JJ, Kuthy RA. The Dental Public Health club and track at the University of Iowa. 2017. Kuthy RA, Levy SM, Warren JJ. Upper Midwest regional dental public health conference: a networking and sharing forum. 2017. Reynolds JC, McKernan SC, Sukalski JMC, Damiano PC. Evaluation of enrollee satisfaction with Iowa's Dental Wellness Plan for the Medicaid expansion population. 2017;327238382522487738503324107791442(3445132 pt 122312525616). Brady P, Ryan G, Askelson N, Worth W, Janson A, Pieper F, et al.. Communication and Behavioral Economics Lunchroom Intervention in Iowa: Evaluation results and recommendations . Iowa City, IA: University of Iowa Public Policy Center; 2017 . Askelson N, Wright B, Smith R, Brady P, Bentler S, Damiano P, et al.. Healthy Behaviors Dis-enrollment Interviews Report: In-depth interviews with Iowa Health and Wellness Plan members who were recently disenrolled due to failure to pay required premiums. Iowa City, IA: University of Iowa Public Policy Center; 2017 . McKernan SC, Pooley MJ, Momany ET, Ingleshwar A, Damiano PC. 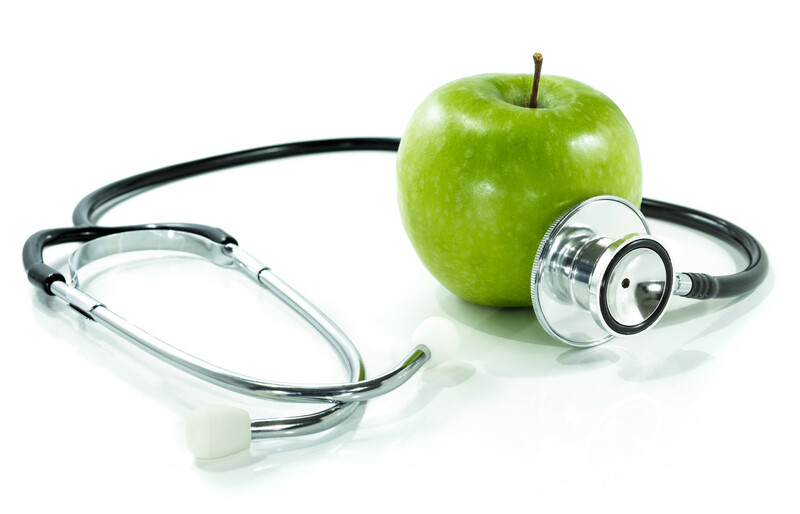 Evaluation of Provider Adequacy in the Iowa Health and Wellness Plan during the second year. Iowa City, IA: University of Iowa Public Policy Center; 2017 . Daack-Hirsch S, Pendergast J, Momany E, Ginader T, Ghattas A, Stewart S. Addressing the Decline in the Uptake of the Iowa Maternal and Prenatal Screening Program. Iowa City, IA: University of Iowa Public Policy Center; 2017 . Daack-Hirsch S, Pendergast J, Momany E, Ginader T, Ghattas A, Stewart S. Addressing the Decline in the Uptake of the Iowa Maternal and Prenatal Screening Program - Policy Brief. Iowa City, IA: University of Iowa Public Policy Center; 2017 .